In a world where criminals are becoming smarter, security systems need to be one step ahead of potential thieves. A functional surveillance installation helps protect your business from all threats, internal and external. An Optiview surveillance solution can give you peace of mind, allowing you to keep a steady eye on your facilities, products, customers, and employees. We understand that all businesses have unique needs. Optiview is ready to help you develop a customized solution to perfectly fit those needs. Our modular solutions can fit any sized business, from small Mom and Pop bakeries, to sprawling outdoor retail centers. Our diverse catalog of cameras and interchangeable DVR / NVR systems allows you to pick the surveillance package that directly suits you and your business. The largest variable in any surveillance system is going to be what kind of camera to install, so we made it simple for you. Here’s an overview of what you’ll be looking for. Also known as a turret camera, these cameras have a ball-and-socket form factor and typically come with a fixed lens (2.8mm / 3.6mm / 4mm / etc.). A general rule of thumb is that the smaller the lens size, the wider the viewing angle. 2.8mm lenses will give you an ultra wide viewing angle of 110°. Armor ball cameras have always been the simplest cameras, feature wise, but are now starting to become available with added features such as wide dynamic range (better light - dark compensation), infrared sensors, and built-in audio. These cameras are housed in an IK10 rated vandal proof housing in which the entire unit is protected by an aluminum base and acrylic dome. Armor dome cameras typically contain varifocal lenses between 2.7mm ~ 13.5mm and can be manual or motorized. Armor dome cameras can come in a variety of sizes. The larger the camera, the more added features it typically has. Advanced models are known to feature alarm inputs/outputs or built-in audio. Bullet cameras are tubular in shape and come in a variety of sizes. Much like the armor dome cameras, the size and functionality of the lens will determine the size of the unit. Smaller units will have fixed lenses, while larger models will integrate varifocal lenses and other technologies. Pan / Tilt / Zoom cameras give the user far greater control than stationary cameras. 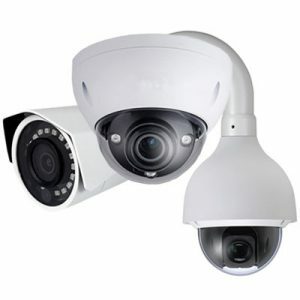 These cameras can be programmed to navigate a predetermined path (a tour), auto-track motion, or be operated manually. These cameras will have a large amount of optical zoom (such as 20, 25 or 30 times), meaning that they can survey a much larger area than a standard stationary camera. Fisheye and Panoramic cameras will record either in 360° or 180° respectively and are used in specialty installations such as on a storefront or over a register (POS systems). Many of these cameras now have built in analytics and special recording features such as dewarping, virtual reality modes or multiple lenses stitched together. Other specialty cameras will perform analytics such as facial recognition, heat mapping or people counting. 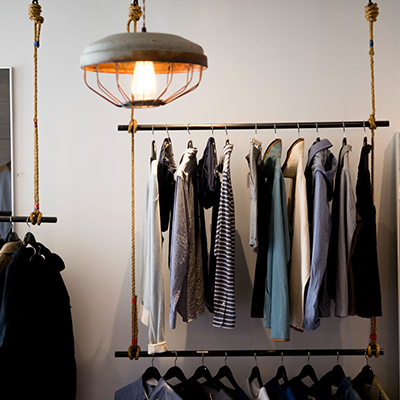 In any brick-and-mortar retail environment, understanding your consumer’s behaviors and protecting your investment (people and inventory) remains critical. In the past these functions were only able to be done separately and were virtually impossible to compile into a real-time report. With the advent of intelligent video surveillance, these items are easier to manage, in real-time, over one device. 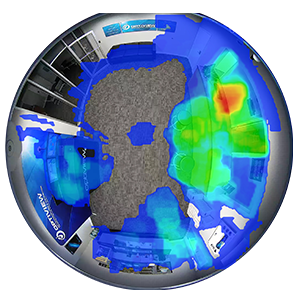 Optiview is continually testing new “intelligent video” surveillance cameras such as cameras that provide heat maps, facial detection and people counting and has brought several on-board. The latest model that has been officially added to the product card is the IP6F, a 6 megapixel network fisheye multi-purpose camera which supports Heat Mapping. What is "Heat Mapping" and how is it relevant? There are several different terms out in the surveillance today that can easily be misrepresented or confused with one another. In this article we’re talking about Heat Mapping, not thermal, which is a completely different technology. A heat map (or heatmap) is a graphical representation of data where the individual values contained in a matrix are represented as colors. In this context, it means a 2D overlay on the screen which shows the lowest to highest amount of change in pixels that are then “mapped” in blues/greens - oranges/reds. Blues represent the “cooler” areas with the least amount of pixel change over time and red represents the “hottest” areas where the largest amount of pixel change over time was registered. 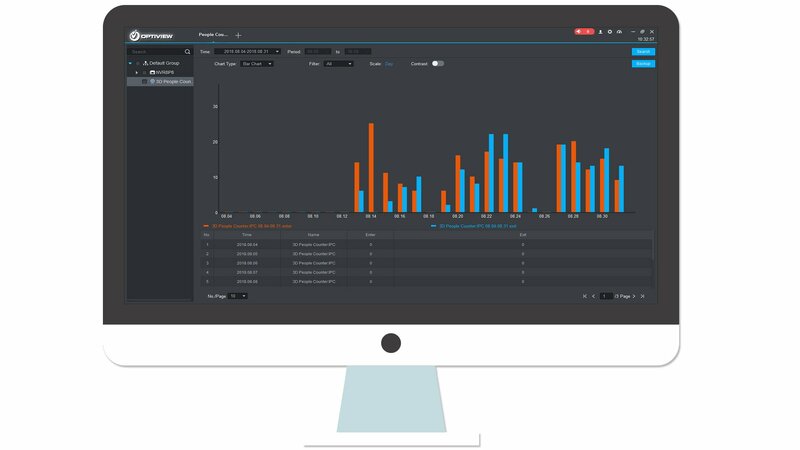 Heat Map video analytics is huge in the retail industry as it helps store managers analyze customer traffic flow through the retail space, and analyze customer behavior (what parts of a display table are being visited or ignored). Store managers and marketers can also gather marketing insights such as making changes to determine if it is the product or the product placement that has a higher pull with the consumers. The “heat map” report can be viewed over the web browser or via the Optiview VMS. 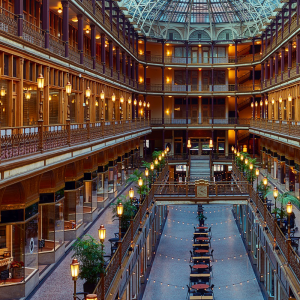 Retail stores have always been interested in tracking not just how many people are entering and exiting the store, but what times are peaks and lulls in foot traffic. Optiview is completing R&D on a new “People Counter” that is expected to be available for sale sometime in the 4th quarter of 2018. The report can be viewed over either a web browser or the Optiview VMS 2018. The term “remote viewing” refers to viewing the video on a machine that is NOT the local recorder that the cameras are plugged into. Optiview offers free a mobile app and free desktop software program that can be installed for remote viewing from on-site (offices) or off-site locations (home offices or while on the road). The Optiview VMS 2018 allows the user to view up to 256 channels at one time, over 4 monitors and will also integrate add-on security features such as access control, and attendance. Users can also utilize new search functions such as People Counting and Heat Map, which requires multi-use cameras that have those intelligent video analytics built in (such as the IP6F). Optiview employs highly experienced Account Managers who will happily assist in building your custom system based on your individual needs. Contact us today at (904) 805-1581 to ensure that you get the right system in place.